The views expressed do not necessarily represent the views of my employer, or any organization. All views are my own. At the opening of the 10th Anniversary Artisphere, the premiere arts festival in Greenville, and one of the top ten of its kind in the country, Governor Nikki Haley reaffirmed her lack of support for government funding of the arts, after standing on a stage supported by those very funds. Click here to watch the video and to read the article from the Greenville News. In her quick press conference following the opening ceremonies and presentations, Gov. Haley highlighted the positive impact Artisphere has had on the Greenville area and the quality of life it adds to the community. But when asked about her support of state funding for the arts through the South Carolina Arts Commission, Haley responded with a disapproval of using tax payer dollars to fund the arts. There are two points I’d like to highlight. First, Haley seemed to be under the impression that Artisphere is only supported by sponsorships, private grants and donations fund the arts. “Artisphere is a perfect example of how they work through grants, how they work through private sponsorships, how they work through artists…we’re here to support what we see is good, we’re here to support exactly what works in South Carolina,” the Governor says. But according to the article, Artisphere receives around $19,000 a year from the South Carolina Arts Commission, and this year received another $5,000 to help fund the installation of a new public art piece commemorating the 10th anniversary of the festival also from the SCAC. All told, $24,000 of tax payer dollars this year went directly into the very event Gov. Haley praised as an “international cultural event”. While the Governor does support the arts privately, there have even many instances where arts-friendly legislation has not made easy treks through the legislature. For the Governor’s first three years, arts advocates fought to restore funding for the SC Arts Commission and even save it from elimination. For each of those years, Gov. Haley either eliminated the SCAC in her Executive Budget Proposal, cut their funding, tried to put them in another part of the budget, and/or vetoed their funding. And every single year, advocates, along with strong bipartisan support in both the SC House and SC Senate, have overturned her vetoes. For the FY14 budget (current year), arts advocates were happy to see the Governor seem to end her war against the arts by maintaining level funding for the SCAC in her version of the budget which came out in January. But if you step back and the look at the bigger picture, you’ll see that FY14 wasn’t all it’s cracked up to be. Each year Haley has aimed at the arts, arts advocates take to the streets (literally in some cases), editorials appear in newspapers across the state, and the arts pick up a ton of press. What Haley didn’t need this year (an election year) was a loud constituency voicing their disapproval. When her budget was released in January, Haley also had no idea if anyone would be running against her in the Republican primaries – a scenario which, paired with upset arts supporters, becomes a perfect excuse for arts supporters to vote in the primary against Haley and hurt her numbers. While progress has been made for the arts in South Carolina (bipartisan support, an increased budget that survived vetoes, cultural district legislation, and more), Haley’s reaffirming of her stance for public funding of the arts raised a lot of eyebrows, including mine. The point is that the arts still have a lot of work to do with both the Governor and others around the country. It takes us all working together to ensure the arts are seen as am important and vital public good. So why wasn’t Shaheen at the Ceremony and demanding that Halley explain where she stands. We need progressive candidates with some moxie to defeat the weasels on the right. Because he is not all about politics. I admire that he doesn’t pull political stunts. Charlie , this is South Carolina . He has got to take the fight to her, if he wants to win. Is Nickie Haley so ignorant that she doesn’t know what the arts do for a community? Yes. She is exactly that dumb. I am shocked Gov.Haley , I am an ex R.E.A.C.H. arts student. SC”s children depend on programs like these to stay focused, be productive and stay out of trouble. Over the past few years as a national guardsman in army and for a security firm I have noticed a decrease in crime but not long ago in last 2 year sc has been losing funding in this, also heroine amongst other drugs are rearing it’s ugly head again through busts right here in Sumter! Great job on roads, possibly giving army a rate of medical bennefits. But we need to start with people not the state! Remove us and there are no votes, it’s we the people who make a difference not just a politician with a vedetta to collect. The entire thing was embarrassing. 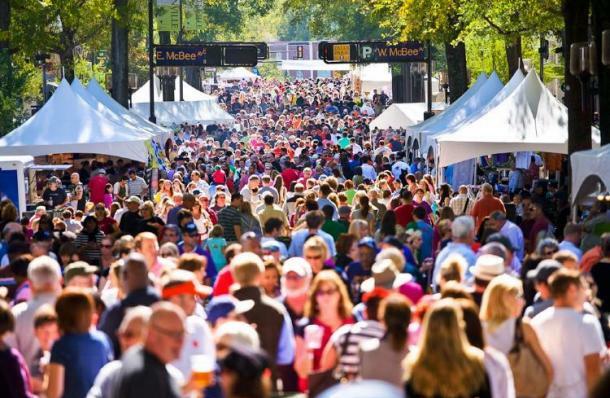 Embarrassing for South Carolina, and I know embarrassing for the artists, volunteers, board members and supporters of the arts who have worked to make Artisphere one of the top 10 arts festivals in the country. Why in the world was she even invited? It amazes me that Haley complains so vehemently against the SC Arts Commission. It was the only station to show her gubernatorial address when she first became governor. Who is cutting off her nose to spite her face? I think Carol means SCETV, not the SC Arts Commission, that to my knowledge has no TV/Radio station. Although that sounds like an interesting addition to all Arts Commisions around the US. You are right about SC Arts Commission since Haley doesn’t see it as necessary. She doesn’t support SCETV either and it was the channel that showed her inauguration speech. Thanks for helping me out with my comments. Carol, thanks for your reply, if truth be known, I am totally a non-political being and fortunately have had very successful careers, over forty years, in the non-profit sector in numerous states including SC, I would most humbly suggest that anyone in public office, of either party, simply adopt the most basic of all common sense policy of ONLY funding non-profit 501c3 organizations that have a proven track record of being able to balance their annual budgets. Fund success, innovation, creativity etc instead of deficit spending!! That is very wise, Darrell. Since the Supreme Court is giving more rights to corporations, than to individual citizens, we should be cautious about what we support with our money. Arts equal jobs, this is not hard to understand. For example, for every professional theatre performance there are related jobs: printers, salaried theatre employees, vendors who supply the theatre & actors. Don’t forget the contractors who build facilities, utility workers, the list goes on. Surprise, these hard working folks are voters. Is your Govenor naive enough to believe that arts and jobs are separate? Is she really bragging about not funding the Arts, as though they have no financial impact on her state. …if your an artist or one who appreciates the arts…please don’t vote for haley!